Hando Sutter, CEO of Eesti Energia, said that buying Nelja Energia is in line with the company's strategic objectives to increase the production of renewable energy. "Our goal is to produce 40% of electricity from renewable and alternative sources by 2022; compared to today, that is a growth by several times and a fairly ambitious objective. Meanwhile, all states by the Baltic Sea are increasing their share of electricity production from renewable sources, several tenders for developers are to be expected and we have good prerequisites for being part of new development projects," Sutter was quoted in a press release as saying. "In the future, we hope to offer an opportunity for everyone interested to be part of the company's growth story and success through the public offering of shares," Sutter added. Enefit Green's CEO Aavo Karmas said that Enefit Green is a rapidly growing renewable energy company in the Baltic Sea region. "The addition of Nelja Energia's assets, competencies and development portfolio makes us a strong renewable energy company. Our development will not be limited to the transaction and we also intend to invest in the production of electric power from renewable sources in the future. Given the projects in the development portfolio, we have truly great potential for growth throughout the Baltic states and in other Baltic Sea countries where Eesti Energia operates," he said. The shareholders of Enefit Green and Nelja Energia signed the contract for the purchase and sale of the shares of Nelja Energia on May 29 this year. The value of the shares was 289 mln euros; in addition, Enefit Green will take over the loans of Nelja Energia in the amount of 204 mln euros. 77% of the shares of Nelja Energia belonged to Vardar Eurus, which is a company owned 90% by Norwegian local authorities and 10% by NEFCO. 23% of Nelja Energia's shares belonged to investors of Estonian origin. The Latvian Competition Authority approved the transaction in July of this year, while coordination from the Lithuanian Competition Authority arrived in August. The transaction was finalized on November 7 after the approval from the Estonian Competition Authority. The buyer was counselled in the preparation and implementation of the transaction by Swedbank Corporate Finance, Ellex Raidla Law Firm and consultation companies PricewaterhouseCoopers and AF. Enefit Green is a renewable energy company owned by Eesti Energia, which produces electricity and heat from wind, water, biomass, solar and mixed municipal waste. 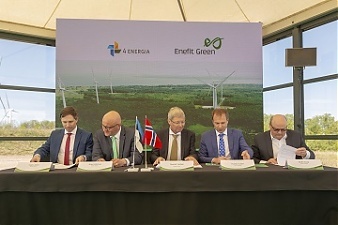 With the acquisition of Nelja Energia, a pellet factory in Latvia and minority shareholdings in bio gas stations and wind turbine maintenance repair companies located in Estonia are added to Enefit Green's production portfolio, in addition to wind farms. After the transaction is finalized, the company will own a total of 398 MW of wind power capacity in the Baltics. The company also owns a total of 25 MW of power generation capacity and 85 MW of heat production capacity in co-generation stations from renewable sources. The electricity production of Enefit Green will increase almost three-fold and exceed the limit of 1 terawatt hour following the acquisition transaction.